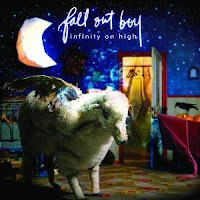 Infinity on High is a compulsively listenable artifact of the culture that arises from the ruins of a centerless worldview. In lieu of any higher authority, we tend to establish ourselves as the be all and end all of our existence. Fall Out Boy’s lyrics reflect this narcissism. The album is not just a celebration of celebrity culture, although it certainly comes off as that. There is a pain in these lyrics hidden beyond the poppy tunes that are an enjoyable departure from the pop-punk formula that permeates the band’s previous efforts. “I’m a stitch away from making it and a scar away from falling apart,” cries “the (After) Life of the Party.” While there might not be anything revolutionary about their pain, it is palpable. They are, through their skillfully produced versions of shoddy myspace poetry, declaring themselves to be the voices of a generation of moderately disaffected suburban youth. While there is much to revile in the hymnody of these self-proclaimed prophets, the fact that it has the potential to be the new Psalter for a large percentage of the youth population is enough to warrant careful listening and consideration. You are currently browsing the archives for the fall out boy category.